World cruiserweight title challenger Matt “Too Smooth” Godfrey (20-2, 10 KOs) finds himself at the crossroads of his professional career, preparing for his June 10 10-round main event throw-down against undefeated, ultra-hyped Nigerian knockout artist Lateef “Power” Kayode for the vacant NABA title, live on ShoBox from Chumash Casino in Santa Ynez, California. 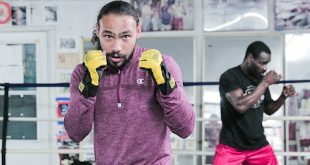 After being stopped for the first time in his career last August, when he unsuccessfully challenged WBO champion Marco “Kapt’n” Huck in Germany, Godfrey was somewhat lost and confused as a promotional free agent. Matt put full trust in his manager, Brett Hallenbeck, who negotiated the fight against Kayode, switched Matt’s head trainer, and guided the Providence fighter into signing a contract with Rumble Time Promotions and DiBella Entertainment. Kayode (16-0, 14 KOs), trained by living legend Freddie Roach, is rated in the top eight in the four major governing bodies: WBA #3, WBO #4, WBC #5 and IBF #8. “Fighting a top 10 fighter is a great opportunity for me to get back where I belong with the top cruiserweights in the world,” Godfrey said. “I needed to take this fight and then win it impressively on one of the biggest networks. A big win puts me in the top 10 and right back in the picture. “I’m confident I can win against anybody I fight because I have all of the tools to beat the best. It’s just a matter or execution. I saw his (Kayode’s) last fight (in which he looked vulnerable against Nicholas Iannuzzi) and he was tested. But I’m expecting to be fighting him at his best, not like he looked in his last fight, because I know he’s been working on making those improvements. The 30-year-old Godfrey is a full-blooded Native American (Wampanoug) who was rated No. 10 by The Ring magazine before his fight with Huck. He has held a number of regional titles including the NABF, NABA, USNBC, WBA Continental Americas and Sovereign Nations Boxing Council. His most notable victories as a pro have been against Felix Cora, Jr, Danny Batchelder, Shaun George, Emmanuel Nwodo, Shawn Hawk, Ernest Mateen and Jermell Barnes. 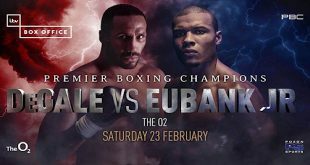 Godfrey-Kayode is a classic match-up of contrasting styles with the consummate boxer taking on the powerhouse slugger.” My game plan is to box but things change sometimes when you get punched in the face,” Godfrey explained. “I realize what this fight means. I’m going in the ring to win this fight with my skills and experience. I will be in the best condition of my life - I guarantee that - and people are going to see the best of me. Years ago, Matt started boxing at Manfredo’s Gym in Pawtucket with “The Pride of Providence” Peter Manfredo, Jr., another world title challenger and star of The Contender, Season One reality television program, and 2004 U.S. Olympian Jason “Big Six” Estrada. Godfrey is back training at Manfredo’s Gym. 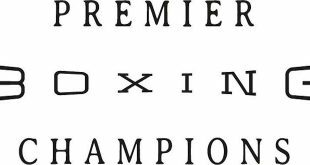 Peter Manfredo, Sr. is his assistant trainer, while Ross Enmait – also a top strength-and-conditioning coach – moved up from assistant to head trainer. Godfrey was an outstanding amateur boxer, culminating with a 194-23 record, and first alternate position as a heavyweight for the 2004 U.S. Olympic Boxing Team. 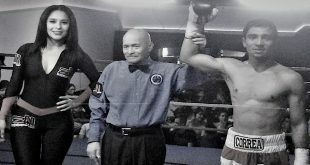 He captured six national championships (four open tournaments including the 2004 Everlast U.S. Championships, plus two in the Junior Olympics), a Bronze medal at the 2001 Pan-American Games, Silver Medalist in all four of that year’s national major tournaments – National Golden Gloves, PAL (Police Athletic League), U.S. Championships and U.S. Challenge – and reigned as a six-time New England Golden Gloves champion. His amateur victims included several leading contemporary pros such as former WBA middleweight title challenger Randy “The Gentleman Griffin), Chazz “Mensa With Muscles” Witherspoon, Devin Vargas, Corey “Black Ice” Cummings, Leonard “Haitian Sensation” Pierre and John Johnson. Now, however, Godfrey is at the crossroads with a monster looming in the opposing corner.